Things could have gone a different way for Jordan Clark. The talented young sportsman only a year ago gave away a promising junior cricket career to focus on his football. But as he gradually rose up draft boards this season, it’s not a decision Clark wishes he could have over. Clark was a genuinely good and quick seam bowler and played for Australia’s under-16s team against Pakistan in Dubai last year. The seamer picked up a hat-trick in a one-day game against Pakistan and finished with figures of 5-37. But the opportunities of an AFL career were too strong for Clark to resist and he committed himself to getting drafted this year, something that will happen next month when names are called at Marvel Stadium. The West Australian enjoyed a super season, winning All Australian honours for his carnival across half-back and also impressing when he stepped into Claremont’s senior side at WAFL level. 2019 SEASON FIXTURE Download it now! There’s plenty of Clark’s game that should translate to the top level. He’s athletic enough (he finished eighth in the 2km time trial at the NAB AFL Draft Combine), a good size (185cm, 80kg) and he plays the sweeping role across half-back with real smarts and tact. He’s also physical and prepared to put his body on the line when required and he plays with a self-assuredness required for his position. Clark can find the ball – he averaged 20 disposals and nearly six rebound 50s across the championships – and he reads the play well to cut off things and start them for his side. His performances at senior level were also strong, averaging 15 disposals over five games. Clark loves to go for the brilliant kick out of the back half, so sometimes that won’t come off. But it’s a risk you prefer he takes as when it does work it really sets up his side. Some recruiters have wondered if he needs to rely on his teammates too much to find the footy, but his balance between contested and uncontested disposals is relatively even. In the way he can quickly turn defence into offense and start an attacking move, Clark shares some similarities to Port Adelaide defender Hamish Hartlett. He won’t be a quick line-breaker (he tested at a handy 3.05 seconds over 20 metres) but he is penetrating by foot. 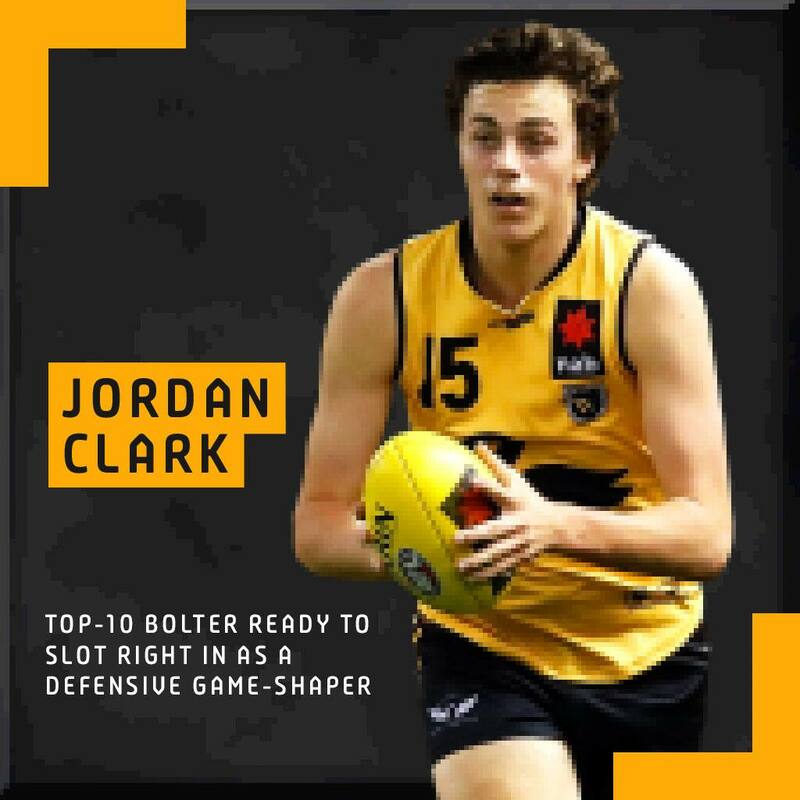 Clark has become a top-10 bolter due to his second half of the season. Some clubs even rank him among the top six or seven players available in the pool. He’ll be picked in the first round on draft night. Has the tools to be a very good player at AFL level. Should be able to slot into a backline and play regularly next year. A game-shaper from half-back.